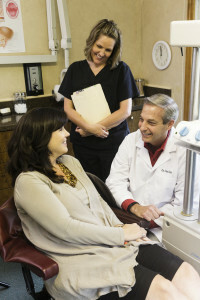 Dr Stevens and his team take an individualized approach to your dental care, rather than treating every patient with “one size fits all” services. Our patients are all different with unique needs and unique treatment options. Listed below are specific services that we provide, but we encourage you to contact us for an appointment so that we can work together to create a treatment plan that is right for you. Periodontal Exam – assess the health of the gums and supporting bone. TMJ exam– check the muscles and joint that hinge the jaw. HD Intraoral Camera – allows the patient to see what the Dr. and Hygienist are seeing. Pit and Fissure Sealants – Coating placed on grooves of back adult teeth to protect from decay. Topical Fluoride – prescription strength fluoride applied to the teeth to protect against decay. Desensitizing Agents – agents applied to root surfaces and exposed sensitive surfaces of teeth to decrease the sensitivity. Removable Partial and Complete Dentures – replacement of missing teeth using a restoration that can be removed and inserted by the patient. Fixed Partial Dentures (Bridges) – replacement of teeth utilizing a cemented restoration that remains in the mouth utilizing multiple crowns as abutments to support the missing teeth. Crowns (Caps) – restorations that preserve underlying tooth structure that may be fragile or fractured. Tooth Colored Fillings – these are fillings that match the tooth color and also adhere to the surrounding tooth. Implant Retained Restorations – these can be both fixed and removable restorations, they can also involve only a single tooth or multiple teeth. Porcelain Onlays and Veneers – these are restorations that are more conservative than crowns, but have more durability than fillings. Recontouring of the natural teeth – some teeth can be reshaped to give them a nicer appearance. Porcelain Veneers (Laminates) – these are thin porcelain restorations that cover the edge and front of the teeth. They can be used to change the size, shape, and color of the teeth. Usually done on the teeth in the smile zone. Cosmetic Bonding – tooth colored material that is bonded directly over the teeth. Can be used to close spaces in front teeth as well as change the size, shape, and color of the teeth. Take Home Whitening – custom trays are made so the patient can take them home and apply the whitening agent themselves. I have been a patient of Dr. Jim Stevens for over 30 years. Since I moved to Madison, Georgia in 1998, I have commuted over 2 hours one way for my dental services. He is very professional and thorough with compassion and integrity. He does not just replace fillings, crowns, and on-lays because of age. He observes and makes recommendations for procedures after careful review. Although the new location in Woodstock will be even further, I will definitely continue to drive to receive the quality of services that he has provided me over the past 30+ years. Dr. Stevens is one in a million!